Shinobu’s dining room isn’t very big, consider making a reservation if you want to avoid disappointment. The décor is sparse and there won’t be small segregated rooms, but what the restaurant lacks in esthetics they make up with their food. 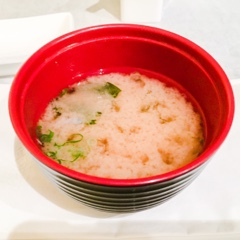 The complimentary miso soup was nice and hot, the cloudy miso revealing cubes of tofu and seaweed. Even on par to some of the ones I’ve paid for before. 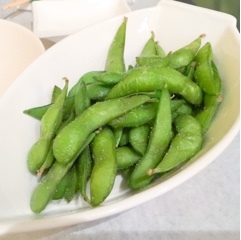 The edamame ($4.50), although not spectacular, was warm and well salted. Torn between all the delicious sounding maki, I was about to order three when our waitress suggested starting off with two. I’m thankful for her warning as they were huge and leftover sushi is never good the next day. 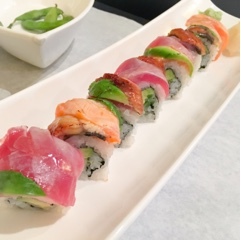 An interesting addition, the lettuce used in the double shrimp cannon roll ($9.80) helped to provide extra crunch along with the tempura shrimp while keeping the maki light. Really, it was your typical dynamite roll with tobiko (fish roe) and avocado, but was a well-executed version. 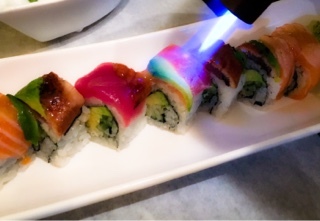 Meanwhile, the volcano rainbow roll ($10.90) was more inventive, blow torched at the table. Slices of salmon, tuna, eel, and avocado glisten on top giving the dish a beautiful contrast and the rainbow description. Overtop was a light diluted honey sauce, which added a delicate sweetness and caramelized a bit from the heat while protecting the seafood itself. 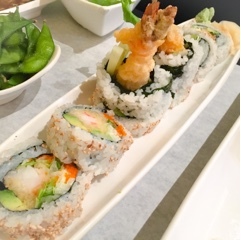 Inside the roll, avocado and tempura bits provided a creamy and crunchy contrast. Unbeknown to me, my friend had switched tables to help the restaurant accommodate another group. 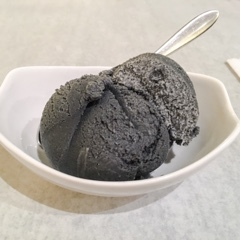 So, after the filling meal they also treated us to scoops of intense black sesame ice cream; very rich and creamy. What a satisfying finish to a new local favourite sushi restaurant of mine.